Bills in the state House and Senate would change the way school districts select classroom material, increasing parental involvement, putting more of the burden on elected, rather than appointed, officials and de-emphasizing electronic materials. I briefly mentioned the Senate bill, filed by Sen. Hays, in a previous post in which I asked what the motivation behind the bill might be. Information in the Naples Daily News article has provided some clues to help us answer that question. The identical bills are the work of the Florida Citizens’ Alliance and Better Collier County Public Schools, two organizations frequently at odds with the Collier County School Board majority and Superintendent Kamela Patton. “Florida History: People and Nations” Collier County 6th grade History: These two pages teach the children that we descended from apes. This is stated as a fact not a theory. Nowhere in the material is a balanced discussion of the biblical explanation. There is a link in their post to a pdf scan of the textbook pages in question. – Poses the question “how can the earths tremendous variety of plants and animals be explained?” states as fact millions of species exist and fossil records document changes over time. Darwin proved species compete for food and only fittest survive and pass off traits to their offspring. This is a totally superficial and disingenuous comparison. No reference of fact that both are theories or offer students references like the well documented series called “ The Truth Project” by Focus on the Family. Reach out to church leaders to help them understand how evil much of the revisionist content is. The History and literature Common Core uses teaches that nothing is true and everything is permissive. 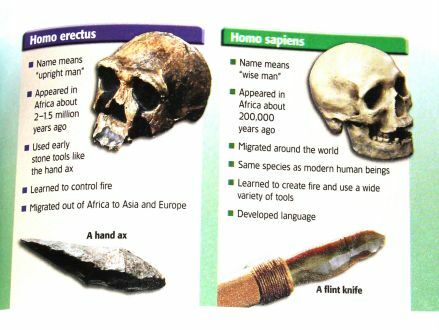 Example: FL 6th grade world History books teach we came from apes as a statement of fact rather than teaching the Theory of Evolution as a theory. Now take a look at their Examples of Acceptable/Proven K-12 Standards and Corresponding Curriculum. One such example is Freedom Project Education, which displays on their website: “Classical, Judeo-Christian, Online Academy”. The textbook they use in Biology is Exploring Creation with Biology. Flaugh said about 80 organizations from around the state have agreed to support the legislation. He expects 15 to 20 representatives from those groups to be in Tallahassee in January to lobby for the changes as the legislative session begins Jan. 12. The motivations behind the bills are now very clear. There is no question. Will you, Florida Citizens for Science members and supporters, respond? This entry was posted in Instructional Materials bills '16. Bookmark the permalink. Thank you for making your readers aware of the issue. It would be very helpful if you could also supply a link or more information on how we can counter this anti-science bill, instead of only links on how to help push the bill through. I understand, Shauna. We’ve only just become aware of this and so we have yet to put together an action plan. We’ll post more information as we all get up to speed on this issue. Greetings from the social studies side of the house. Just want to point out that is definitely is NOT just science that would be impacted by these bills. I have shared the recent posts on this with state social studies organizations, and it may be worth your time to perhaps do some outreach/collaboration there. Not really happy with this. Thank you very much for bringing social studies folks to our attention! Of course, we realize that more than science is impacted, but we are just focusing our efforts on our expertise. We would love to join hands with other affected organizations!